I’m a completionist. ARCHICAD 21 has been out for almost 500 days. Patrick May and I have already written the little changes blog post for ARCHICAD 22. The developers at GRAPHISOFT are already hard at work on the next version of our beloved software and Beta-testing season isn’t far off. Nevertheless. Steps should not be skipped. Challenges should not be ignored. Blog post series should not contain holes. I’m also leading a webinar later this week focused on users looking to make giant upgrade leaps and wanted to remind myself of all the improvements introduced last year. 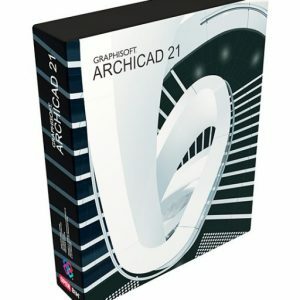 Ergo, let’s look back at ARCHICAD 21 and talk about many of the wonderful minor features that transformed the way we worked. Maybe there are still some features that you’ve overlooked. Fortunately it’s never too late to add them to your workflows in ARCHICAD 21, 22, or beyond. 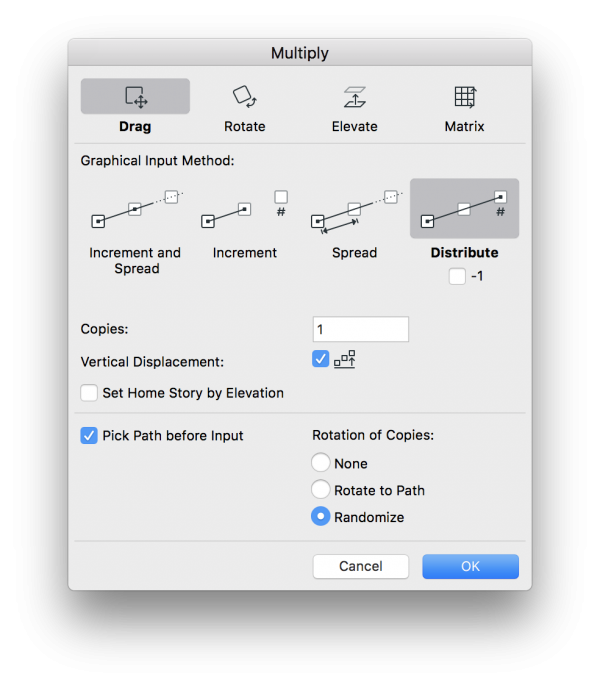 The multiply command has long been a useful editing tool in ARCHICAD. In ARCHICAD 21, the tool was expanded to include path and rotation features. The palette was also redesigned. The primary operations of the feature remain: multiply by Dragging, Rotating, Elevating, or by a Grid Matrix. The input method is also the same, or similar. An additional Input Method has been added: Increment and Spread. Distribute and Distribute -1 are combined in a single icon with a check option for ‘-1’. The major change has come in the added path before input and, my favorite feature, the rotation of copies. Picking the path before input allows you to multiply along non-linear vectors, curves, or any other continuous shape. It works really well with the Magic Wand feature. The rotation feature allows you to generate a more random appearance for copying elements along a vector. This is especially useful for placing landscape elements, where plan symbol and 3d appearance can be improved by rotating slightly for a random orientation. 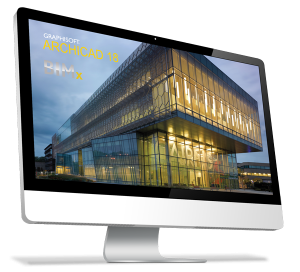 There are a few improvements in ARCHICAD 21 to drafting tools and features. One seemingly minor change is the way dashed lines are handled at corners. Previously, control over Polyline corners seemed random, and frustrated every graphic standards obsessive (ie, like 90% of ARCHICAD users). Since ARCHICAD 21, we can now make dashed Polylines meet in dashes at the corners. It is important to note that this only applies to the Polyline tool. All 3d based elements or other drafting tools still lack this control. The other awesome improvement to drafting tools extends beyond just the Polyline: improved Pet Palette option for curved edges. This Pet Palette option allows you to add a node to any curved edge. Previously the workflow was to place a node, which straightened an edge, move that node, then add the curve back. Now it is a simple process of clicking the new pet palette option to add a node. There is no longer a loss of curve. 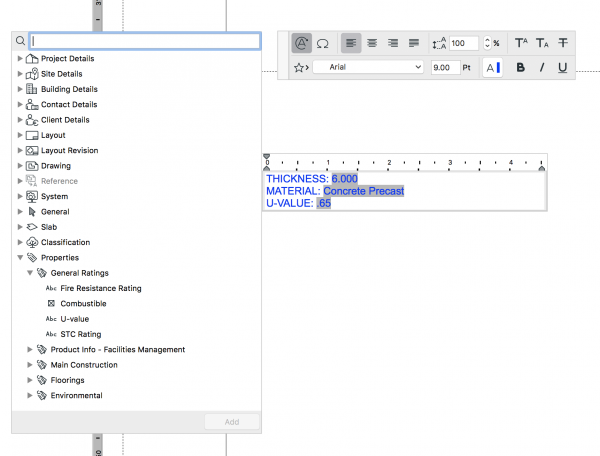 Autotext is not a new feature in ARCHICAD 21, but it has been expanded to a much more useful range. Previously autotext in Labels was as limited as in Text Elements: Project Info only. 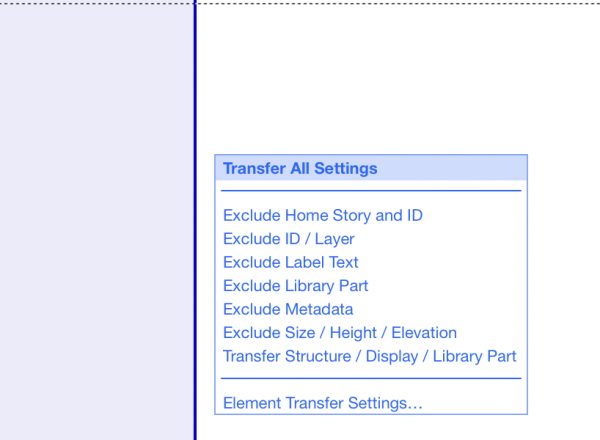 In ARCHICAD 21, a new label type was added; or more accurately, the Text label was expanded to the Text/Autotext label. 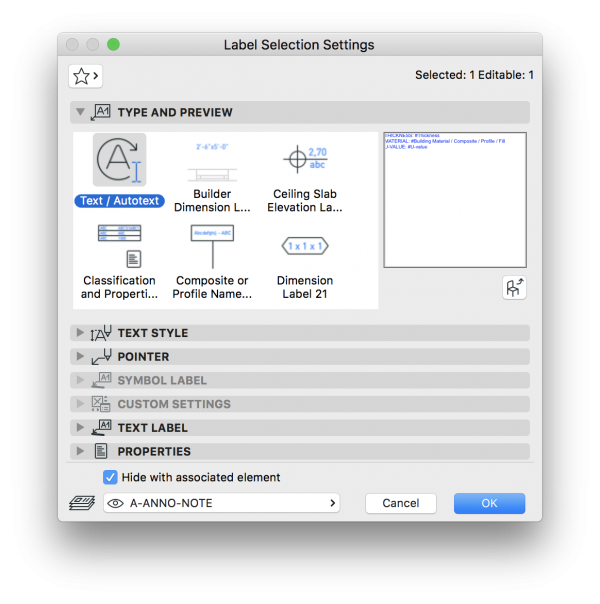 This updated label allows any geometry or attribute to be included as part of the label, as well as properties. This is a critical improvement to information management, since it centralizes and coordinates information and application of that information. This means (as in the example below), that if a slab thickness, material, U-value, or any other information applied to an element changes, the labeling changes with it. It links information to elements the same as dimensions are tied to actual model and plan geometries. 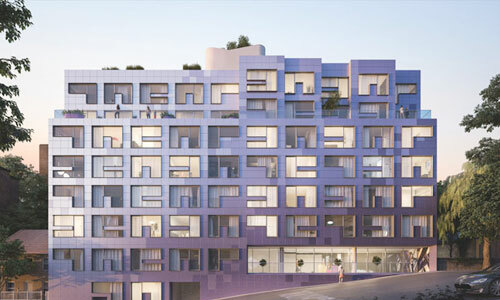 Parameter Transfer is an essential tool within ARCHICAD. If you aren’t using it, you’re not using ARCHICAD correctly. In previous versions of ARCHICAD, Favorites had Favorites Parameters to control what from each favorite get applied. This was pretty limited to settings like Element ID or Home Story as settings to apply or ignore. 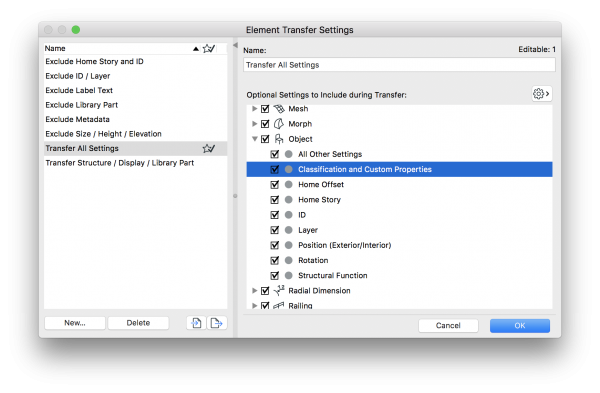 This feature has been split out, expanded, and merged with Parameter Transfer to become Element Transfer Settings. These settings get picked up and injected by the “eyedropper” and “syringe” tools, as well as applied by the Favorites. Notice the Star/Check icon next to the option above for “Transfer All Settings”. This is the default option for the favorites palette. Starting in ARCHICAD 21, when you go to inject parameters into an element, you are given the choice what set you want to include. PRO tip: make sure your Favorites are set to exclude Home Story. 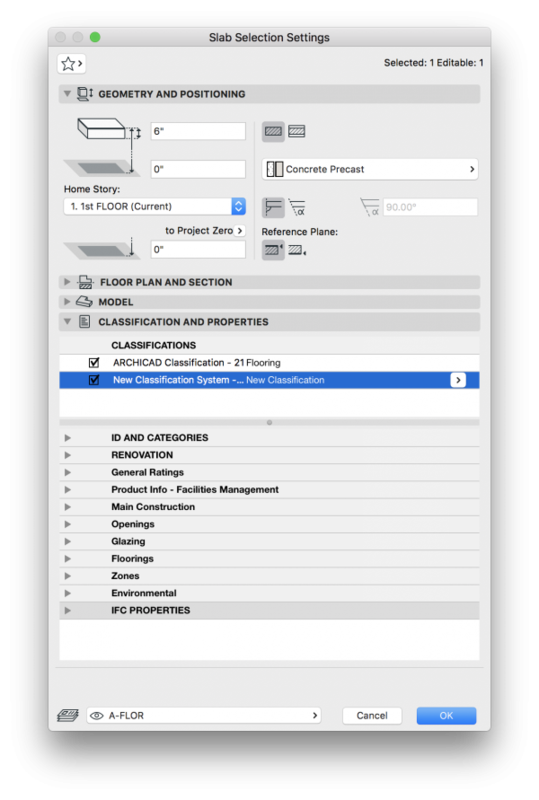 Classifications are not new to ARCHICAD, but the ability to generate custom classifications is. 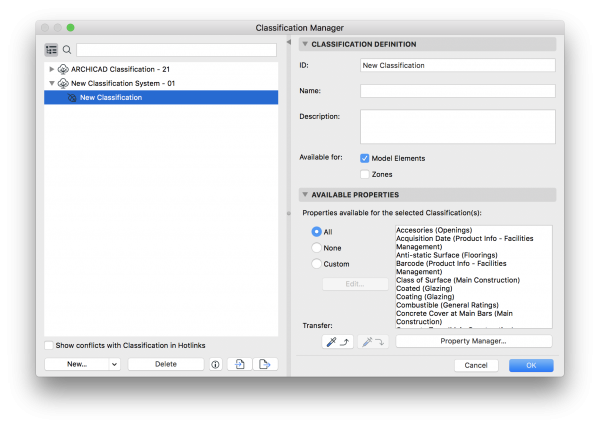 This means, as of ARCHICAD 21, you can generate your own classifications or import standard classification systems. Elements can have multiple sets of information applied, in the form of properties, and multiple classification definitions. Before we were only permitted to use IFC standard class, we can now import Master Format, Uniclass, Omniclass, or any other standard classification system available. If you are into reinventing the wheel, it is also easy to add new classification systems yourself, and apply these classifications in tandem to the IFC standards. The improved diversity and accessibility of Classifications in ARCHICAD 21 definitely improved the quality of the data in my ARCHICAD files and also has me thinking more and more about how elements are grouped in ways other than Tool and Layer. Translators were previously located in the application support folders on each computer. So that they had to be matched between computers for everyone to have the same output when teaming up on a project. Furthermore, a translator had to be reassigned when publishing to IFC, since it would path to each user’s application settings, rather than directly to the file. Now that an IFC manager integrates the translators into each project file and template, every user has access to the same translators and translator settings for quicker and more seamless import and export of IFC files. One very important note about the IFC management is that files migrated from AC20 to 21 may not include these translators. You can, however, import them in by going to File > Interoperability > IFC > IFC Translators; then clicking the import button (arrow w/ sheet symbol in the bottom center of the palette), then browse for a default (not migrated) template or project file. Once imported, all users accessing that file or template will have access to that project’s IFC translators. DWG translators are still organized through external application support, and need to be matched between all users, and relinked when publishing teamwork files, as was done in all previous versions of ARCHICAD. We can export Scenes with the folder structure from the PhotoRendering Settings. This seemingly minor change makes template creation and rendering settings sharing so much easier. Renovation Status is now a Criteria for Graphic Overrides. This is wonderful. We have official Touchbar support for those of us using newer model MacBook Pros. In my estimation, Touchbar support for ARCHICAD gives those of us using newer model MacBook Pros a slight advantage over other ARCHICAD users. The clarity of the touchbar and how it changes the available buttons depending on the active view is fantastic. My favorite feature is that whenever you select an element, a button appears on the touchbar to allow you to edit its Composite, Complex Profile, or selection settings. 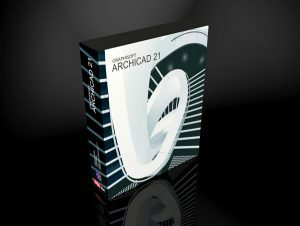 This is the ARCHICAD 21 installment of the series on all the little changes to ARCHICAD. 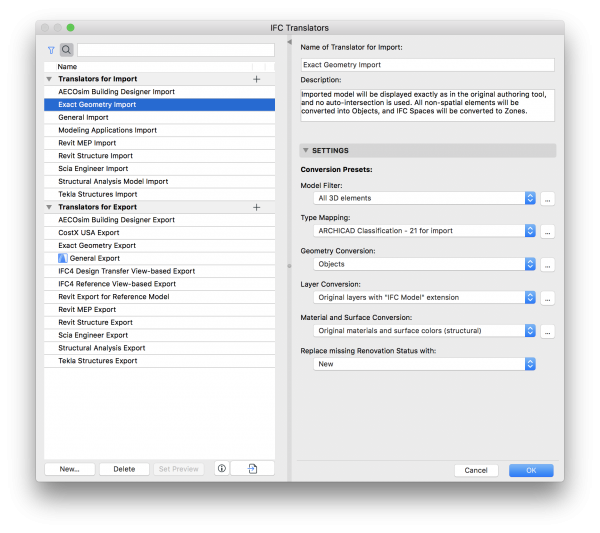 Here’s some links to the ARCHICAD 15-20 and 22 version of this post. To accompany these blog posts, below are the official lists of undocumented features on the Help Center. I love that there’s documentation of undocumented features. There’s clearly some beautiful Hungarian logic there. As always, I recommend reading through the undocumented features list in its entirety. There are gems in there that you might find extremely valuable.